Gordana Čomić has served as Vice President of the Serbian Parliament since 2008. She graduated as a physicist and lectured in Physics at the Faculty of Technical Sciences in Novi Sad until 1999. 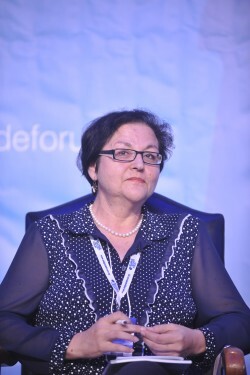 She has been active in the Democratic Party since its foundation, and has held numerous party positions, including sitting on the City Board of the Novi Sad Democratic Party, President of the election headquarters of the Novi Sad DP and President of the Provincial Board for DP Vojvodina from 1998 to 2001. Čomić served as Vice President of the Democratic Party from 2001 to 2004 and she has been a deputy in the Serbian Parliament since 2000. She became President of the Women’s Forum and a member of the Presidency of the Democratic Party in 2006. She speaks English, German and French. At the OSCE PA 23rd annual session in Baku, National Assembly Deputy Speaker Gordana Čomić was elected rapporteur of the OSCE Parliamentary Assembly Third General Committee on Democracy, Human Rights and Humanitarian Questions, for the second time.